Our “Revival conference” began back in 2005 with what was called the Emerging Church Conference. World renowned singer, songwriter and worship leader Robin Mark of Belfast, Northern Ireland (author of Days of Elijah and many other well–loved worship songs), along with his pastor Paul Reid came first in 2005 and through them God poured out hope, life, and renewal. We knew it was special. Since then, our hopes and prayers for Revival in PEI and across Canada have increased in intensity, fueled by many prophecies that we have a special blessing upon us. If we have found favor with the Lord, then we are honoured and give great thanks to our Saviour and King. We pray that you will come and experience worship like never before and hear teaching meant to be personally yours. Our worship is anything but staid or somber. We are a party in a church (conga lines have happened)! There is freedom and joy in the music and we celebrate being together with Him who created it all. There is humor and life in the teachings and stories shared from personal experience. Our God is an awesome God. He loves you! We hope you come and experience a personal Revival. 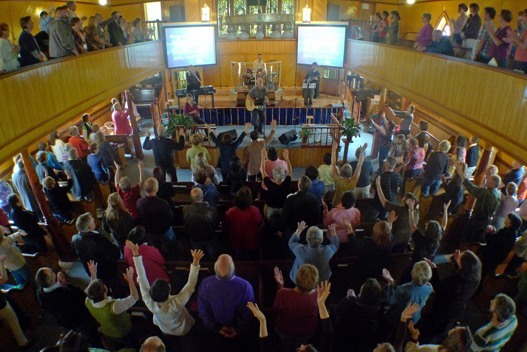 For more information, visit our RevivalInBelfastPEI.ca website.